Wishing all a Happy Canada Day! Today is a special Canada Day for me, as it is the official release date of Bearing the Saint, my novel about the pilgrimage of the Company of Cuthbert with his body about the north of England and Scotland in the face of the Viking invasion in the late 9th Century AD. But what does a saint from early medieval Northumbria have to do with Canada? As it happens, there are quite a few churches bearing his name in this fine country, and a few schools. They are Anglican, Old Catholic, Roman Catholic and Presbyterian and perhaps others. It appears that the oldest St. Cuthbert church in Canada gives its name to the community of Saint-Cuthbert in Quebec. My French is very rusty, and the Google translation is poor, but as near as I can figure out, one James Cuthbert, aide-de-camp to General Wolfe, was in at the fall of Quebec to the British in the late 1700s. James Cuthbert appears to have been one of that ancient family in the north who trace their lineage to the very people my novel is about, the company of Cuthbert, who were made up of both layfolk and monastics, and some of whose earliest members and their children and grandchildren are named in the Historia de Sancto Cuthberto. ” C’est en 1766 que la localité reçoit le nom de Saint-Cuthbert, lorsque le seigneur James Cuthbert, aide de camp du général Wolfe qui a fait l’acquisition de ces terres quelques années plus tôt, en fait don à la fabrique, à condition que son nom soit donné à la nouvelle municipalité. L’année suivante, on y érige une petite chapelle en bois et en 1879, l’église en pierre est bâtie à l’initiative de l’abbé Kerbério, curé de Berthier. L’église existe toujours et a été classée monument historique, ainsi que le presbytère, en 1980. The oldest Presbyterian sanctuary in Quebec can be found at the junction of routes 138 and 158. Cuthbert built the chapel to honor the memory of his wife in 1786. It has been protected as a historical monument since 1958, and currently hosts a very convenient visitor’s bureau, open from May to October. Travelers will find an informative guide here to over 20 other heritage buildings, including the original Berthier Grammar School (1880-1917) at 562 rue Montcalm and the last of the Cuthbert manor houses in Berthierville at 710 rue Frontenac. The house built in 1821 by Lanoraie seigneur Ross Cuthbert to accommodate servants stands west of Berthierville on Route 138 (701 Grande-Côte Est.) It was occupied until the 1970s by the last descendant of the Cuthbert family to live in the area, Margaret Bostwick. 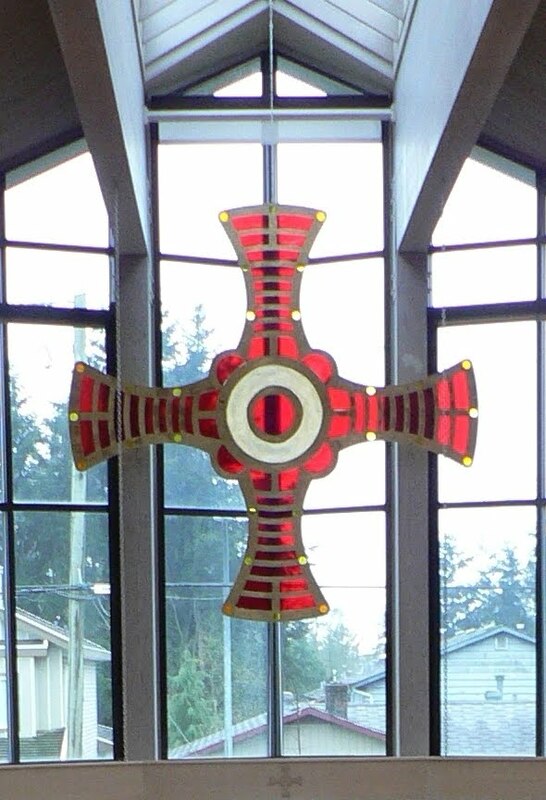 Meanwhile, I offer this picture of the lovely stained glass St. Cuthbert’s cross, taken and cropped from the web page of St. Cuthbert’s Anglican Church, Delta BC. I hope they won’t mind…I have been to this church a number of times when my daughters took part in music recitals in the bright beautiful space of the church nave.